Ankle length skirts are specially designed for a slimmer feminine look. 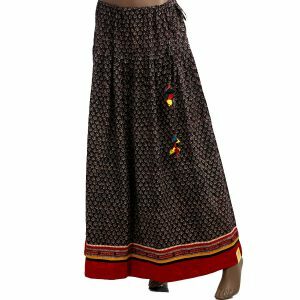 The skirt is embellished with delicate, detailed hand embroidery and mushroo fabric; Pull string with handmade tassels to adjust the waist. style it to the occasion for a contemporary or ethnic look. 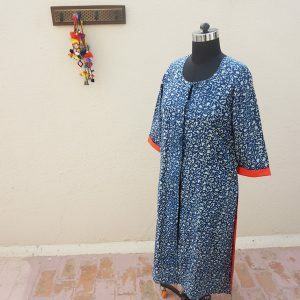 Fine ankle length blue wave pattern ajrakh skirt specially designed for a slimmer feminine look. 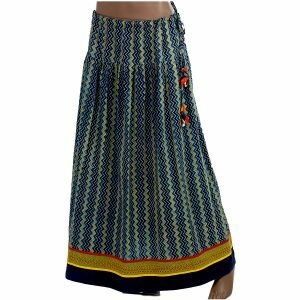 The skirt is embellished with delicate, detailed hand embroidery and mushroo fabric; Pull string with handmade tassels to adjust the waist. 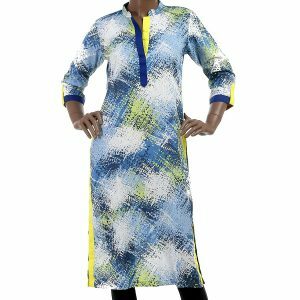 style it to the occasion for a contemporary or ethnic look. 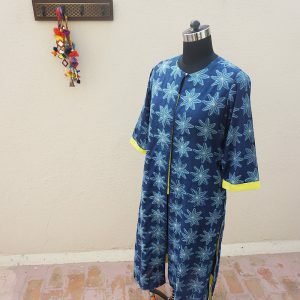 Blue hand tie-dyed cotton mul fabric top with chinese like collar and short sleeves. 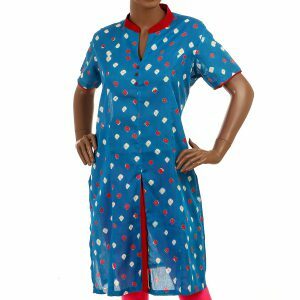 A soft and comfortable wear, with a coloured pleat in the center for hot summers. 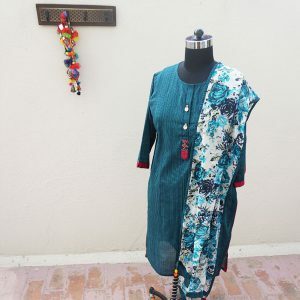 Style it with salwar, pants or chudidars. 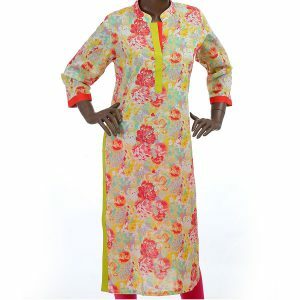 Classy Linen, soft floral print in shades of beige is a must ‘OWN’ garment for your wardrobe. Plane shade of natural linen is matched to the sides complementing the print design. 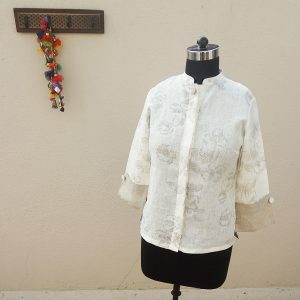 Beautiful dark shaded mother of pearl button is hidden in the double layered button panel. Handmade fabric buttons highlights the off white shirt. 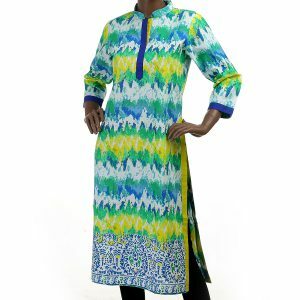 Abstract colourful print cotton, practical wear kurta, simple, elegant, having a statement of its own. 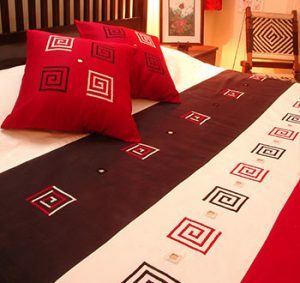 Plain colours are added as accent for a dramatic look and feel active quotient. 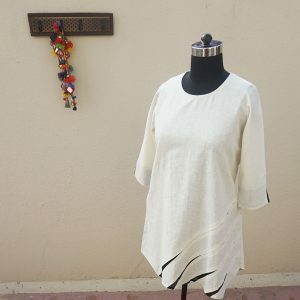 This top can be best matched with plazos, pants or chudidars. Ankle length brick red striped skirt specially designed for a slimmer feminine look. 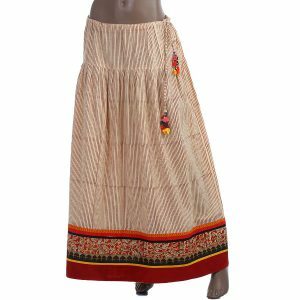 The skirt is embellished with delicate, detailed hand embroidery and mushroo fabric; Pull string with handmade tassels to adjust the waist. 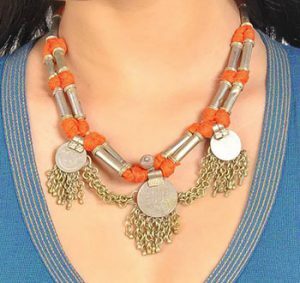 style it to the occasion for a contemporary or ethnic look.